Restaurants seem to lose their minds at some times of year. At Christmas perfectly decent kitchens seem to ditch their standards and serve “what the people want”. All innovation disappears and, like it or not, the only fayre is turkey and trimmings and the ghastly Christmas pudding. Don’t argue with me – Christmas lunch is heinous so why serve it more than the compulsory once? Valentines Day has a little more scope. Some restaurants go all out with the full oysters, asparagus, aphrodisiac routine. Others just serve the usual dishes but change the names to add some luuuurvvvv! The weekday steak and kidney becomes Sweetie Pie for one night only. For Valentines I took my wife on a mystery tour to The Beeches Bar and Grill in Hampton in Arden. It was only as we made our way that I realised mystery tours need to be used with caution. It can go one of a variety of ways and not many of them end positively. My wife spent the journey speculating on previously undeclared preferences – “I really fancy pizza – have you booked an Italian restaurant?” We’d just been to see the rather good Lion movie with Dev Patel and unfortunately this also gave her an impulsive, but nonetheless declared, last minute taste for Indian food. Even worse I realised that Hampton In Arden is also home to a Michelin starred restaurant. – Peel’s at Hampton Manor. As we made our way towards the village I realised that her expectation was growing! First impressions of The Beeches is that there is a huge parking area which looks only partly full. When we arrived we were able to go straight through to the restaurant. Most of the places I called were offering sittings on Valentines Night to cope with the demand and, thanks to Lion, we were on the 9pm shift. I’d not really appreciated it before but there is something rather different about the 14th February. All tables are for two people. As the Beeches has mainly wooden tables for four this meant that the restaurant looked rather underoccupied. The menu chose a rather clever way of dealing with Valentines Day with sharing platters rather than the cheesy nomenclature or Route #1 ingredients. I think this is a clever option. We opted for a “fruit de mers” which was slightly different. I was expecting (mainly because I’d not read the menu properly) a platter of chilled seafood. Instead we got a mixed plate which included brown crab fish cakes, smoked salmon, some garlic prawns and some dressed crayfish. After the initial surprise we really enjoyed the crayfish. They were in a slightly sweet yoghurt dressing which made them stand out from other things on the plate. The crab fish cakes were well executed but somehow needed something to make them standout – a nice crisp coating and some tasty brown meat but a dip or a dressing would have helped. The aioli was Ok but just not interesting enough. Some good smoked salmon was nice with some decent bread, The prawns were sufficiently garlicky and prawny. We both opted for venison Wellington for our main and this was a really good dish. Wellington is a bit of a challenge – getting the meat cooked to the right colour without harming the pastry. We ended up with a uniformly cooked tasty pastry case, a good mushroom and kale filling and some good venison which was still pink and tender. This was accompanied by a very good mash which tasted as if it could have had some cheese through it but the other star was a very good Rioja reduction which was full of delicious savoury flavour and really brought everything together. Dessert, after a short break, was a platter of three desserts – basically, smaller portions of the three other desserts on one plate. The lemon posset was slightly stiff and would not allow the excellent shortbread biscuit on top to be used as a wafer without breaking. The main culprit was a layer of raspberry jelly on the top which prohibited ‘dipping’. Once we’d breached that skin we were able to make biscuity progress. Flavours were spot on with some real zing and creaminess. The chocolate tart was OK but has quite thick pastry. What saved it was the combination of the vanilla ice cream and popcorn – all there together on a spoon was superb. Our favourite was the strawberry and clotted cream cheesecake. There was supposed to be chocolate sauce with this but I couldnt see it and really didn’t miss it. The pistachio crumb just added a little texture to a very good pud. With two glasses of wine and a tip the meal came to just over £100 which I thought was pretty good value. I think The Beeches Bar and Grill chose a pretty smart menu for Valentines Day. It’ll be nice to try it for the regular menu. 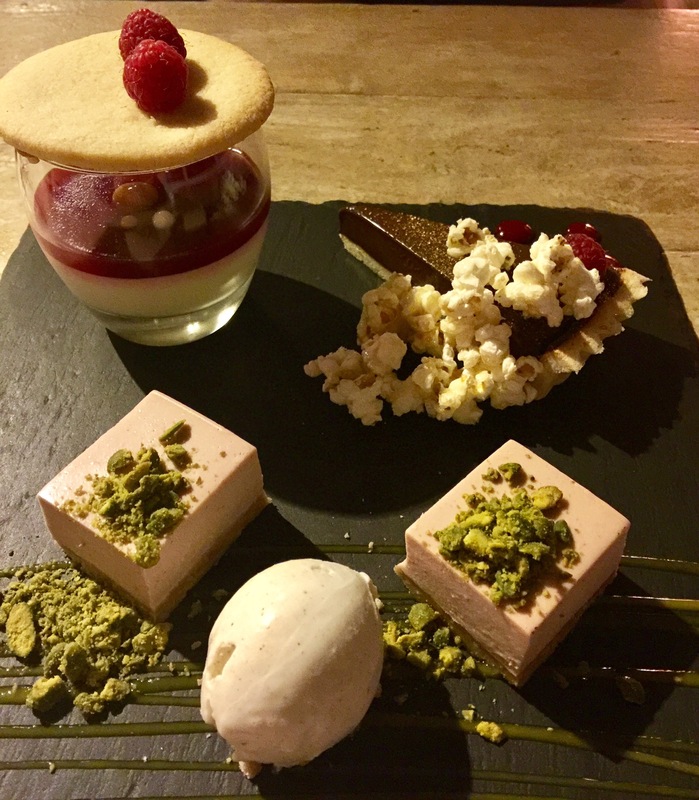 This entry was posted in Review and tagged aphrodisiac, Christmas lunch, crab, crayfish, fishcakes, lemon posset, platter, popcord, prawn, Valentines Day, Venison, Wellington. Bookmark the permalink.